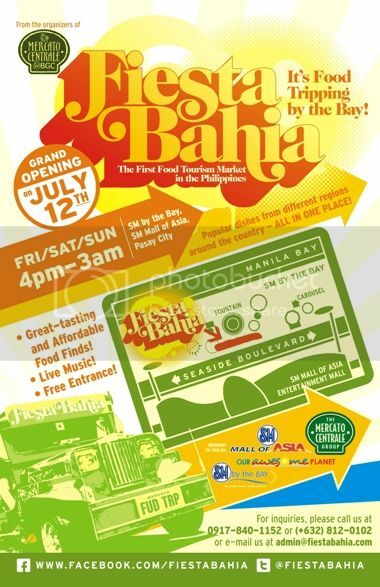 Fiesta Bahia, the Philippines’ first food tourism market, will be officially launched at the SM Mall of Asia (MOA) tomorrow, July 12, 2013 at 6:00pm. Fiesta Bahia is the latest brainchild of the Mercato Centrale Group, which has been behind some of the top weekend lifestyle food markets like Mezza Norte, Levante and Cocina Centrale. Fiesta Bahia will offer a variety of mouth-watering dishes from all over the Philippines to welcome foreign guests to one of Manila’s top tourist destinations. In an interview with Today Show food blog, Bizarre Foods host Andrew Zimmen predicted that Filipino will be the next big thing. Chef and culinary expert Anthony Bourdain of “No Reservations” also shared in his blog on the Travel Channel website that he enjoyed sisig and Cebu lechon during his visit to the country, said Anton Diaz, co-founder of Mercato Centrale and the popular food and travel blogger behind www.OurAwesomePlanet.com. Interested food vendors may contact (+63 917) 840-1152 or (+632) 812-0102 or admin@mercatocentrale.ph. Priority is given to those who specialize in regional/provincial food. Fiesta Bahia is located at SM By the Bay, near the fountain across SM MOA Entertainment Mall, and it is open every Friday, Saturday and Sunday from 4:00pm to 3:00am. This entry was posted in fiesta Bahia, Mercato Centrale, Mercato Centrale Group, Press Release, SM Mall of Asia. Bookmark the permalink.